Discover "Italy’s Green Heart," where Italian traditions flourish in the idyllic farmlands and rustic wooded hills. Experience warm hospitality in Umbria’s ancient cobbled towns, and strike out onto the backroads, where each bend offers a soaring view and every trattoria a memorable local meal. Stay in a farmhouse on a working farm in the olive groves outside of Spoleto and Spello. Day trip options: Assisi, Perugia, Gubbio, Todi, Spello, Spoleto, Deruta, Torgiano, Cortona, Rome, and many more! You can also choose your party size and date at left date for pricing and availability. Can't decide? Visit multiple Untour regions, below! 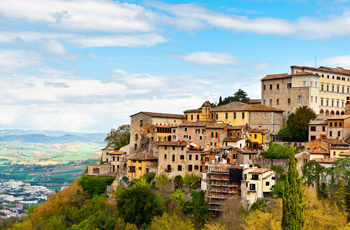 Day trips: Spoleto, and the delightful hill towns of Todi, Trevi, Gubbio, Montefalco and Amelia are all nearby. In addition, there’s Bevagna, Orvieto, Assisi, Perugia and Cortona. Longer day trips to Rome (2.5 to 3 hours), Florence (3.5 hours) and Siena (2.5 hours) are also possible. Sightseeing: Our “hometown” of Spoleto offers a Roman theater and the famous Duomo (cathedral) as well as many worthwhile churches and castles. The world-famous Spoleto Performing Arts Festival takes place each July. The Basilica of San Fransesco, now completely restored, is one of the highlights of the elegant and intimate nearby city of Assisi. Don’t miss the Duomo at Orvieto or the chocolates at Perugia! Off-the-beaten-track treasures that can’t be beat: Visit the Cascate delle Marmore (one of Europe’s most popular waterfalls), the pottery towns of Deruta and Gubbio. Walk the city walls of Spello or visit Torgiano, the town where Rubesco wine was born. Vatican Museums and St. Peter's guided tour - Skip the line! Guided walking tour of Colosseum and Ancent Rome - Skip the line! WHAT'S INCLUDED IN THIS UNTOUR? One or two weeks in a farmhouse apartment, often on a working farm with stunning countryside views. An orientation with our local staff person, who is full of excellent recommendations for your sight seeing, practical advice on driving and parking, and a listing of local events happening during your stay. A regional map, local information, plus our own Untouring Umbria guidebook, researched and written by Untours staff, full of the best restaurants, sightseeing, and other suggestions. A local cultural activity, like a tour of a local, organic farmstead, including a home cooked meal with the owners. Ciao, bellissimi! I've been to Italy about 20 times, speak Italian fluently, and I'm often mistaken for a native while I'm there. Find your perfect tour and your perfect vacation rental, in one package - on one of our unforgettable Untours!